Fancy a return trip to the Peloponnese? 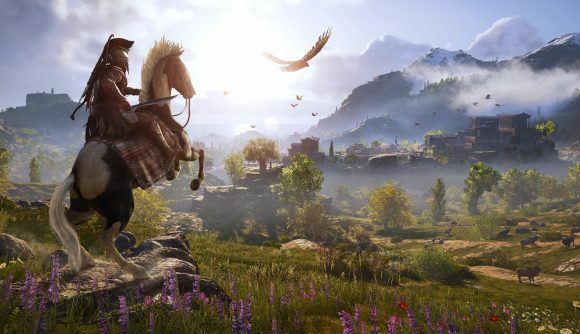 Assassin’s Creed Odyssey’s new game plus mode will be arriving this month, so you’ll be able to take your endgame character back through Ubisoft’s expansive Greek adventure. Ubisoft tweeted this week that new game plus will finally make its way into Odyssey sometime in February, but didn’t provide additional details about the mode. The feature was announced prior to Odyssey’s launch and it was eventually added into Assassin’s Creed Origins in about the same time-frame, four months post-launch. In Origins, new game plus let you take your endgame-level Bayek through the game’s story once again, keeping your unlocked skills and testing them against beefed-up enemies. However, Odyssey introduced a somewhat controversial level-scaling system, whereby enemies and quests would keep up with your character level to make sure the game stayed challenging. Not everyone cared for this, as it made the game feel a bit flat in terms of challenge, and Ubisoft eventually added in an option to disable it. That may make it slightly less appealing to replay the game with top-tier equipment and skills, particularly if you played through Odyssey before the option to modify level scaling was added. However, if Odyssey’s new game plus mode is similar to Origins, Ubisoft has probably added some new inducements to play again. In Origins, completing the story on NG+ awarded players a legendary outfit for Bayek called Mythical Warrior. If Ubisoft does the same thing for Odyssey’s NG+, that would at least mean some sweet new gear to use when Odyssey’s next DLC, The Fate of Atlantis, comes out this spring. I confess to being a bit puzzled by the use of the ‘tea’ meme format here, but I suppose it does make the tweet more noticeable – and new game plus is a difficult idea to convey in an image. Assassin’s Creed Odyssey has proven to be the most popular title in the series to date, surpassing Origins – which had been in the lead – in concurrent players on Steam in the first few days after it launched. The first two chapters of its first DLC package, Legacy of the First Blade, is available now.